I had never heard of meltaways until I read about them on my friend Jami’s blog. They sounded so light and delicious and I was all set to make her recipe until I measured out my flour and had just barely 1 1/4 cups. So off to the Internet I went, and I came across this recipe which was super easy to make. The cookies are so light that they really do melt in your mouth. But the flavor? Just didn’t do it for me, and I found them to be really bland. I brought them into the office today and while they weren’t a hit with everyone, they did seem to attract quite a following. It seems people either love or hate these cookies. Me? I’m a hater. Combine all cookie ingredients in large bowl. Beat at low speed, scraping bowl often, until well mixed. Divide dough in half. Shape each half into 8×1-inch log. Wrap each in plastic food wrap. Refrigerate until firm (1 to 2 hours). Heat oven to 350°F. Cut each log into 1/4-inch slices with sharp knife. Place 2 inches apart onto ungreased cookie sheet. Bake for 8 to 12 minutes or until set. (Cookies will not brown.) Cool completely. Combine all frosting ingredients in small bowl. Beat at medium speed, scraping bowl often, until fluffy. Frost cooled cookies. In other cookie news, Aunt Helen’s Mandelbrot recipe won a Hallmark Magazine Cookie Contest, and I got some really fun prizes! Hahah, I’m sorry that you’re a hater. They look so pretty, though! What a disappointment! I hate it when I make a recipe that sounds fantastic, only to discover that it’s a bust. Thanks for your honest review. Still, I might be tempted to try these anyway, since I love lemon and I’ve made meltaways. I wonder what could improve these? I like things super lemon-y. It’s so hard to find something that has just the right taste, you know? @justJENN – Have you ever made the lemon cake I made a few weeks ago (the Ina one)? It is seriously one of the best cakes ever, and VERY lemony! Sorry you didn’t like the ones you made. I really liked mine. I have to say, the 1/2 cup cornstarch kind of wigs me out! @jami – I know, me too!!! It was a strange addition! yum! i love lemon flavored goodies. i wonder if you could substitute margarine to make this recipe vegan…. I think they may have been bland due to the amount of your zest and juice proportions. Your friends recipe was only 1/2c + 2 Tbsp more than your flour amount (your amount of cornstarch compensates for that), yet she has double the amount of zest and juice. I think that may have been the issue for being bland. Have you ever tried a glaze of just powdered sugar and the juice? Lighter yet more intense….So give your recipe a try again with more zest/juice…don’t give up on the meltaways….I love these type of cookies! Good luck! Anything that melts away in the mouth sound good to me! Yum! Congrats on the Mandelbrodt win! 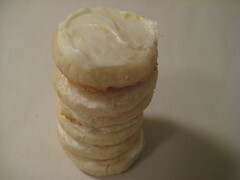 And these cookies look really good from here–I like the tip about adding some more zest / juice–I love a nice, lemon-y cookie!